More and more children are developing Myopia, nearsightedness. Glasses and contact lenses can fix the problem, but they won’t be able to slow the rate. 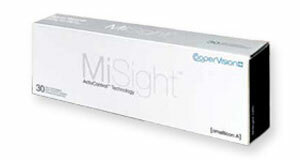 MiSight daily contact lenses are able to fix nearsightedness, but also able to slow the progression in children as well. CooperVision’s Myopia Management System is a holistic approach to minimizing the progression of myopia by combining MiSight contact lenses with ActivControl™ Technology. Why Do I Want To Control Myopia? A reduction in progression of myopia could mean a lower prescription giving better vision when not wearing glasses or contact lenses. For children who would go on to develop high levels of myopia (for example -6.00D or more) a reduction in progression of myopia could mean not only a lower prescription giving better vision when not wearing glasses or contact lenses but also a lower incidence of eye diseases associated with high myopia such as retinal detachment or glaucoma in later life.